Home Editorial What’s Wrong With America? Donald Trump was a know racist way before he was elected President. AFRICANGLOBE – A bloody weekend in America followed a week of suspense, during which bombs were intercepted in the mail. By Sunday evening, 13 Americans had been killed, several injured, a string of assassinations-by-mail averted, and three white Americans were in custody awaiting trial. Throughout the week, pipe bombs were mailed to leaders of the Democratic Party, including two former U.S. presidents. By Friday, police had managed to trace the bombs to one of the Republican supporters of President Donald Trump. The list of bomb recipients was composed of American personalities whom Trump had made a target of his vitriol. On Saturday, a white supremacist entered a Synagogue in Pennsylvania with an assault rifle and three handguns. He opened fire, killing 11 and injuring many others. He was subdued and taken to court on charges of hate crime. On Sunday, another white supremacist — this one in Kentucky — tried to commit a hate massacre by forcing his way into a church with a predominantly Black congregation. When he failed, he went to a nearby store, shot dead a 69 year-old Black-American in front of his 12 year-old grandson, and fled to a nearby parking lot, where he ran across another Black person, whom he also killed. Police later arrested the white supremacist terrorist. America’s bloody weekend came amidst reports showing a spike in hate crimes. According to the Anti-Defamation League, hate crimes against American Jews have increased, this year, by 57 percent. But hate crimes do not spike by themselves. Their uptick requires agitation, which many believe to have been on the rise since the election of President Donald Trump in 2016. Since he first ran for office in 2015, Trump has used all kinds of verbal abuse against anyone who disagreed with him. Trump even encouraged his partisans, during his rallies, to assault journalists. He praised a Congressman who, during his electoral campaign, insulted a reporter. Trump repeatedly accused the media, which he calls Fake News, of being “the enemy of the people”. More often than not, it is Trump’s statements that have proven to be false, compared to accurate reporting in the media. But Trump’s biggest sin came last year, when he refused to denounce white supremacists after they had held a rally in Charlottesville, Virginia, during which one of the supremacists rammed his car into a crowd of opponents, killing a young woman. Despite slogans shouted such as “Jews will not replace us”, Trump insisted that there were “fine people on both sides” of the Charlottesville event, stopping short of unequivocally denouncing the white racists. 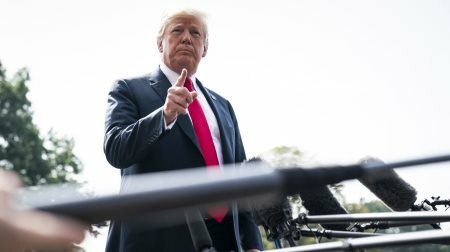 Trump’s speech has not only been directed against his opponents and America’s minority groups — such as Blacks, Jews, Muslims and Latinos — his style has been ruling through continuous campaigning, whether for his reelection in 2020 or for the mid-term elections. In his ongoing campaign, Trump has been using keywords that experts describe as “dog whistles”. These are words or ideas that Trump throws into his statements and speeches to make sure that his partisans are always scared and ready to vote. “Dog whistles” mean that Trump has to go after Black people, immigrants, Islam and others, out of which he can create scarecrows. The problem is that when Trump threatens the Republican base, a few Republicans take his threats seriously and, instead of voting only, decide to take matters into their own hands. The guy who shot at the Tree of Life Synagogue wanted to stop the work of the Hebrew Immigrant Association Society (HIAS), started in 1881 and designed to help assimilate refugees in America, regardless of their ethnicity, religion, or skin color. The guy who mailed bombs wanted to kill every one of the Democrats whom Trump blames for America’s ills. Ever since his election in 2016, Trump has stirred hate speech, and the result has been a corresponding rise in hate crimes. If Trump was a non-American living anywhere around the world, the U.S. government would have seen him as an agitator of violence worthy of silencing. Over the past decades, America has spent a substantial amount of resources in an effort to counter global hate speech, the root cause of terrorism. Trump’s hate speech is exactly what the U.S. has been trying to fight and eradicate around the world. The problem is that the person who is spewing hatred is himself at the top of the same government that has dedicated decades to fight hate speech and consequent terrorism. The election of Trump has turned things upside down in the U.S. and around the world, and not in a good way. Those who are hoping for a restoration of things back to normal may have to wait out Trump’s presidency, but, looking from now, this may not be the case even in 2020.